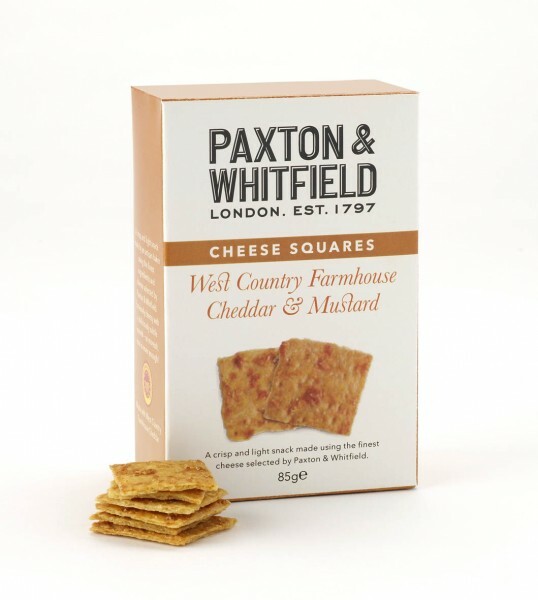 Light and crisp nibbles, made with cheese specially selected by Paxton & Whitfield. A perfect accompaniment to drinks. IngredientsWheat Flour, West Country Farmhouse Cheddar PDO 15.3% ( Milk ), Water , Butter ( Milk ), Grana Padano ( Milk ), Mustard Powder 0.8%, Mustard 0.2%, Salt, Pepper. Our Cheese Squares are made by an artisan bakery in the heart of the West Country, using the finest ingredients and cheese selected by Paxton & Whitfield. Light and crisp, with a melt-in-the-mouth finish, they are incredibly moreish, making them the perfect accompaniment to drinks. West Country Farmhouse Cheddar and Mustard – flavoursome artisan Cheddar combined with mustard to create an extremely cheesy nibble with a delicious, subtle warmth. Made using 21.5% cheese.